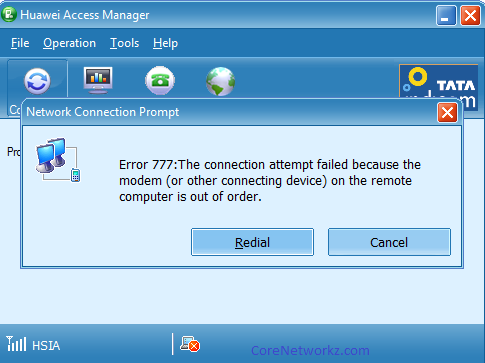 For the last few weeks, I have been getting an error message "Error 777: The Connection attempt failed because the modem (or other connecting devices) on the remote computer is out of order" while connecting to the Internet. I use Huawei Access Manager to connect to the Internet because the modem provided by Tata Photon Plus is from Huawei. Mainly the issue occurs in the evening (that means the peak time) and the error message prompt me to either redial to connect to the Internet or cancel. Here I would like to share the major reasons of "Error 777: The Connection attempt failed" and its possible solutions. After a few attempts, I would be able to go online but in some worse cases, I waited hours to get rid of the error. If you are not sure how this error message looks like, have a look at the screenshot provided below. In addition to the above-mentioned reasons, I am getting this error message only in peak time. So I assume, the network users can also be a factor but I am not sure. The major reason for "Error 777: The Connection attempt failed because the modem (or other connecting device) on the remote computer is out of order" is faulty modem driver. However, in my experience just restarting the computer itself fixed this issue. So here I would like to share a practical guide to fix this error message. Uninstall the current modem and reinstall it with the latest driver available. If the issue persists, it is advised to contact your ISP to fix it. Some of the related issues and solutions are provided below. i m still facing the same issue, after applying several attempts. If you are still getting the error code 777 with remote computer out of order message even after following all the steps mentioned in this article, the issue might be at ISP end. I recommend you to contact technical support of your ISP to resolve the issue. The connection then is successful. Not sure if this will help TATA users. Thanks for sharing your solutions.